In early 1860s, Milton Clifford Jeffers (1823–October 26, 1896), an agent and broker from New York, devised and in 1863 patented (US patent 40105) a simple adding device, quite similar to the earlier devices of Jabez Burns and John Ballou. 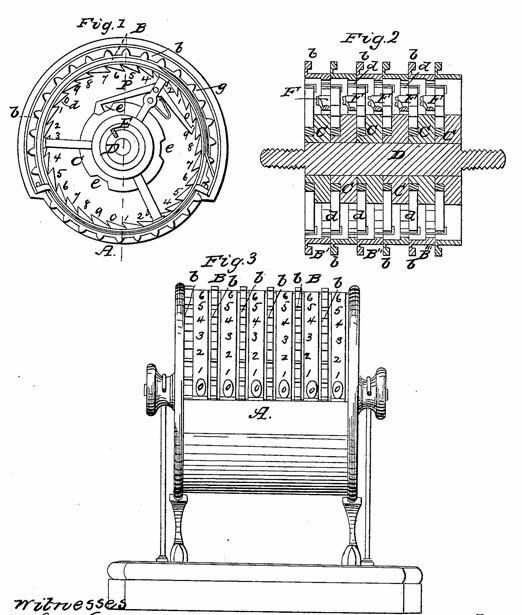 In his patent he also mentioned, that his device is an improvement of the machine of Joseph Harris from 1861 (US patent 31016). Later Milton Jeffers took out several other patents for machinery (No. 108484, No. 234265). The patent model of the device (see the lower photo) survived to our time and is kept now in the collection of National Museum of American History in Washington, D.C. It is a brass, steel and paper device with overall measurements: 10 cm x 11.5 cm x 10 cm. The machine is a lever-set adding device, featuring a frame of two brown round end pieces joined by a central shaft and by two handles of brass at the outside. The shaft carries six toothed wheels that may be rotated with the fingers. Each wheel has 30 teeth and is joined to a brass ring on its right (thus implementing a carry mechanism). 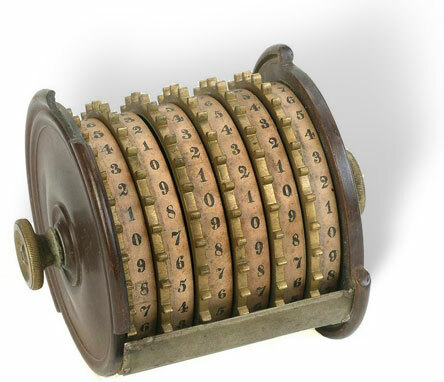 Around the rim of each ring is a slip of paper with the digits from 0 to 9 printed on it three times. One third of each ring is covered by a metal piece whid a window at the bottom and the digits from 1 to 9 engraved on it. To enter digits, the operator must rotate wheels forward the distance indicated by these digits. The total appears in the windows.